Fonality is a flexible-deployment complete business communications solution that adapts to your changing needs. It is a cost-effective platform that lets you eschew the need for uneconomical on-premises applications as it has a host features that can give you total control over your business phone system. With Fonality, you can enable your organization to add remote workers to your team. The solution has powerful integration capabilities that can connect a wide variety of applications to Fonality. Thus, you can expand your support outside of your office premises while ensuring that your customers continue to receive seamless caller experiences. Moreover, you can streamline your business communications workflow with the help of Fonality’s administration tools. These features provide your callers with a broad array of options for them to receive the assistance they require quickly. Other than that, the solution gives you access to call records and offers you reports whose insights you can use to optimize your processes. 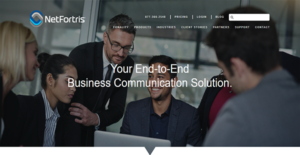 Fonality offers you the best out of a business phone system and a unified communications platform as it is powered by NetFortris, a leader in business communications solutions. It adapts to your needs and enables you to deploy it in public clouds, private clouds, or hybrid environments. The software even supports multi-location deployments. Because of its flexibility, you can also be elastic when it comes to meeting the challenges of an ever-changing business landscape. Unlike traditional on-premises solutions, Fonality does not bind you to fixed PBX or telecom contracts. Aside from that, the software offers a more extensive range of features at a low cost. This makes the application an economical choice that suits your budget and your needs. With Fonality, your team has access to tools that allow them to handle calls easily. One of these is the drag-and-drop call handling feature that lets them hold, transfer, or lead to voicemail a call with one click. Other than that, the software has a voicemail management system as well that enables you to access your voice messages on your phone or desktop as an SMS or email. That way, you can swiftly return calls and resolve issues. A solid team does not need to have all of its members in one place at the same time. That is something NetFortris is aware of, which is why Fonality empowers your remote workers to collaborate with their office-based colleagues as if they are on the same floor or building. Fonality has a browser-based administration panel where you can modify the system on the fly. It is also user-friendly and so does not require advanced technical knowledge to be manipulated. Other than that, Fonality enables you and your administrators to view call records to review your employees’ performances. By accessing call history, you can assess whether or not any member of your team requires further training. As such, you can devise strategies to help them learn and be proactive in ensuring excellent customer service. If you are interested in Fonality it may also be beneficial to check out other subcategories of Best Business Phone Systems listed in our database of SaaS software reviews. Each company has different wants and requires a software that can be personalized for their size, kind of workers and customers, and the particular industry they are in. For these reasons, no system can provide perfect features out-of-the-box. When you try to find a software system, first be sure what you require it for. Read some Fonality reviews and ask yourself do you need basic tools or do you require sophisticated functionality? Are there any industry-specific tools that you are looking for? Get the answers to these questions to aid your search. There are plenty of factors that you need to mull over and these include your finances, specific business needs, your company size, integration needs etc. Take your time, check out a few free trials, and finally choose the system that provides all that you require to improve your organization competence and productivity. How Much Does Fonality Cost? NetFortris offers three enterprise pricing options for Fonality. The packages and their inclusions are detailed below to help you decide which one is the most suitable for your organization. The Professional and Ultimate enterprise pricing options include a free phone rental. We realize that when you make a decision to buy Business Phone Systems it’s important not only to see how experts evaluate it in their reviews, but also to find out if the real people and companies that buy it are actually satisfied with the product. That’s why we’ve created our behavior-based Customer Satisfaction Algorithm™ that gathers customer reviews, comments and Fonality reviews across a wide range of social media sites. The data is then presented in an easy to digest form showing how many people had positive and negative experience with Fonality. With that information at hand you should be equipped to make an informed buying decision that you won’t regret. What are Fonality pricing details? What integrations are available for Fonality? For more information regarding interfaces, visit the website for the documentation or get in touch with the support team. If you need more information about Fonality or you simply have a question let us know what you need and we’ll forward your request directly to the vendor.